Tide and time wait for no man… as we discovered when we took on the forces of nature to deliver a challenging section of railway from Boneybefore to Downshire Station in County Down. 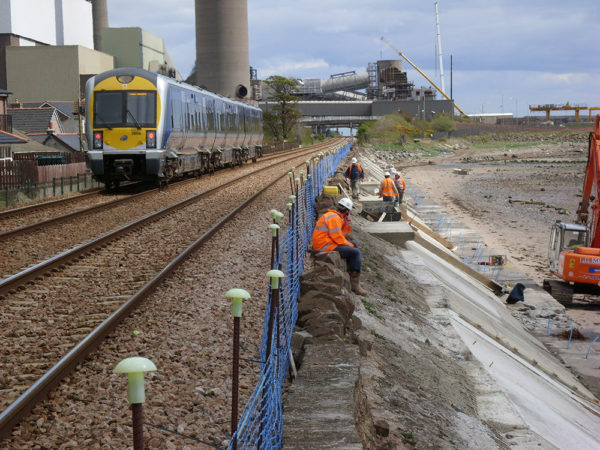 Northern Ireland Railways (NIR) commissioned us to deliver phase 2 following the success of the first phase to construct 450km of sea defences along the coastal rail route between Carrickfergus and Kilroot Power Station. The railway line runs along the top of an existing embankment and passing trains have no protection from rough seas. Voids had formed in the existing stone revetment which had become unstable due to many years of marine erosion. Under the latest scheme we created a 580m long concrete reinforced structure and a 3m high apron slab along the revetment to defend the coastline. All work had to be carefully planned and carried out from the beach in six-hour shifts between high and low tides.